We’ve made our name by reconditioning and refurbishing used and scrapped batteries, but those aren’t the only products we work with. We also have many new forklift batteries for sale. If your current batteries aren’t lasting long enough for your work shifts, it is time to buy a replacement. There is no need to tie down two forklift batteries in one work shift because they don’t hold their charges as well as they once did. All of our new forklift batteries for sale are of the highest quality and come with a 7–year warranty; these things are built to last. Please see our new forklift battery prices below. 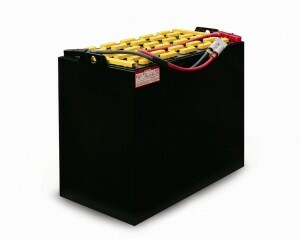 We carry batteries ranging in voltage from 12 volts to 80 volts. If you don’t know what forklift battery goes into your lift you can use our forklift battery selector tool on our quote page. You can search by manufacturer and model to determine which batteries your forklift is compatible with. Remember to practice proper charging habits with your new forklift battery to maximize its lifetime usage. The ideal time to charge your batteries is not simply whenever it is convenient to do so. When the battery dips below 30% of its reserves is the ideal range at which to begin charging to full. You must also take care to not overcharge the battery. Don’t forget that once this new forklift battery nears the end of its lifecycle, you can send it in to us for refurbishing. This is an affordable alternative to buying another replacement battery—and it will be guaranteed to retain at least 85% of the battery’s original capacity! This can almost double the lifetime use of any given forklift battery. What’s not to love? If you need more information or need a custom battery quote, please use the contact page or call us Tel: 619-737-5944 during business hours and we will do our best to answer all of your queries. We deliver to the Contiguous USA.